To borrow from Coldplay's Chris Martin – who, love him or hate him, is a vocal supporter of fair trade – nobody said it was easy. 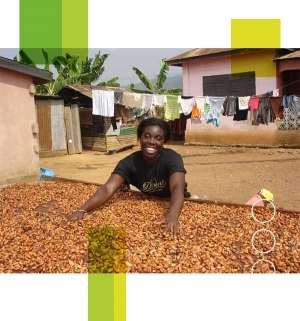 Whether you're a chicken farmer in the home counties, a hub for local enterprises in south London or a cocoa supplier sourcing from the developing world, making sustainability a priority presents an ongoing, if vital and frequently rewarding, challenge. 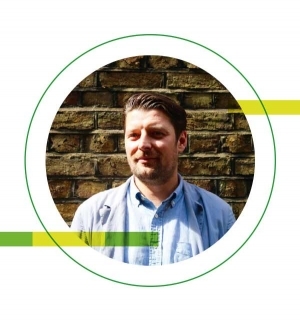 We've spoken to a few of the companies – and the organisations pushing for change throughout the food and drink industry – for whom doing things in a sustainable way is woven into day-to-day business, and find out how it tests and improves them. And as we said, it isn't easy, but with passionate, enthusiastic people and open yet demanding consumers, nor does it need to be hard. For us at Origin, a core principle of speciality coffee is to enrich all participants in our supply chain. Sustainability at the source – both social and environmental – is obviously a critical part of this. We're fortunate to be in a position to source primarily through a direct-trade model, whereby we purchase coffee directly from a coffee producer, a co-operative of producers or a mill. Using this model we gain the greatest amount of transparency in our supply chain, which allows for control of quality and ethics. Within our direct trade model we work with producers and mills dedicated to environmentally and socially sustainable practices. We visit the producers regularly, talking to them, their families and workers – looking and listening – and pay at least 50% above the Fairtrade price to ensure they receive the prices they deserve for quality and sustainability. This, of course, does not mean that we only want to work directly with producers as there are equitable and valuable relationships to be found all over the industry, such as trade through importers or collaborative importer partnerships, and many certifications that fit within these methods and do great work, such as Rainforest Alliance, Bird Friendly and Fairtrade. They make trade of sustainable coffee more accessible for many companies. The sustainable production of coffee at source is of course a hugely critical one. When the green coffee reaches our roastery in Cornwall, we roast using two Loring Smart Roasts; the Loring is among the most environmentally friendly coffee roasters available. Compared to a traditional roaster with an afterburner, the Loring can produce as much as 83% less C02. At the roastery we have a practitioner member of the Institute of Environmental Management and Assessment, who is currently working on an environmental audit of everything we consume and how we use it, with the aim of identifying measures to reduce environmental impact of the roastery and wider business. We need to educate people about the value of speciality coffee – quality, traceability and ethics – and how prices translate into a cup. At Origin we live and breathe speciality coffee, but for many consumers what that is and means is a relatively new thing. On face value, it could therefore be difficult to understand why a cup of speciality coffee costs a particular amount. Sustainability is a massive subject and a big part of our job is to help chefs, restaurant managers and of course the dining public by chopping it up into tasty, bite-sized, easily digestible chunks – covering everything from where the food on the plate comes from and how the tip you leave is distributed, to what restaurants are doing to reduce the amount of food they waste and a whole lot more. 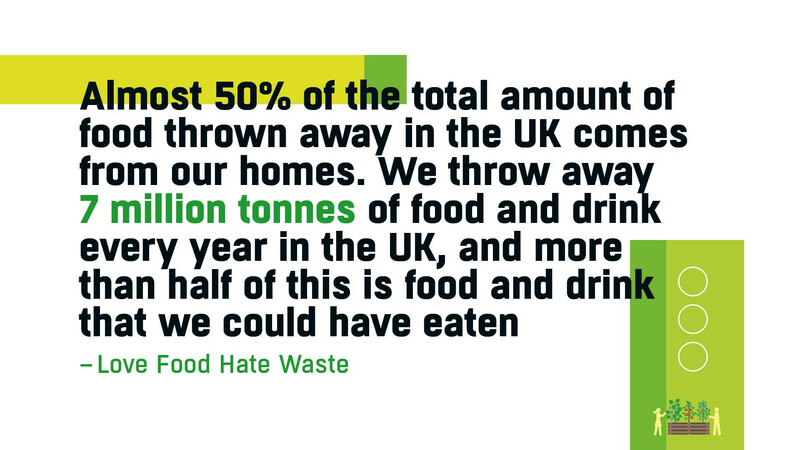 The appalling amount of food that restaurants waste is one of our top priorities – the equivalent of one meal in every six ends up in the bin. Restaurants are now waking up to the environmental, social and economic cost and many are now taking positive action to ensure food ends up in its intended target – a human belly. Whereas ten years ago it was a fashionable additional item on the menu, sustainability is now built into the very make-up of many new restaurants – provenance is king, waste is evil and people won't stomach staff being treated badly. 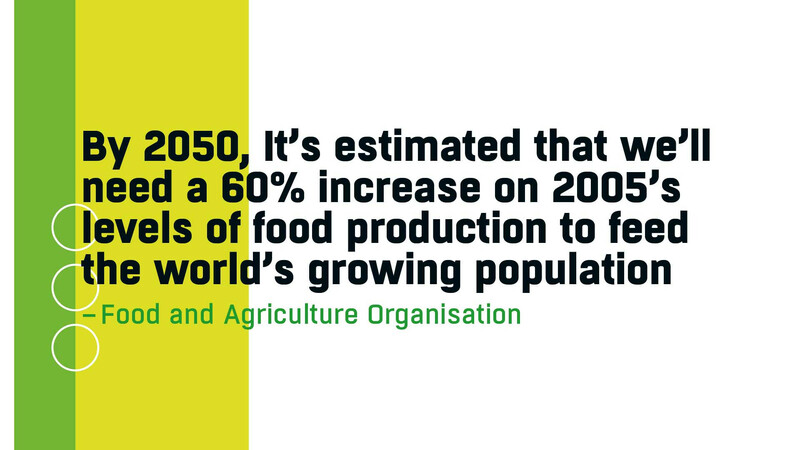 As Raymond Blanc says, we are undergoing a food revolution. Next time you're eating out, just take a moment to think about the meat you're eating; the quantity and quality. You can try and go one day a week without it or mix it up and try the increasingly inventive and delicious veggie options appearing on menus across the capital. Apart from anything else, it'll leave more cash in your pocket to choose some top-quality cuts the next time you eat out. 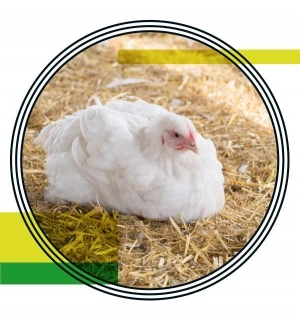 For most poultry farms, sustainability has to take a back seat, as most parts of the business are based around long-distance transport, inefficient processes and lowering costs in all areas no matter what the effect on the environment or birds. At The Thoughtful Producer we've done things the other way around – our view is that our birds are only as good as the environment they're raised in, so from the ground up our business is built around ensuring the most natural and sustainable surroundings for them. Obviously this comes at a cost, as it's inevitably cheaper to source items with no regard for where they're coming from – sometimes half way across the world – but as our name suggests, we think carefully about all aspects of our business to ensure the most natural, sustainable and high-quality products. We started out with the ethos that our poultry should be as nature intended and therefore everything we do is about creating a natural and sustainable home for them. Everything that can feasibly be done on our farm is done there, and for everything that can't be we look at the most thoughtful option. Our chicks are brought in from a natural hatchery only 30 miles away, and from then on they're here living in our beautiful surroundings. This is perfect synergy for us, where sustainability goes hand-in-hand with our view on natural being better – not only do the birds have the best life possible, ranging on our beautiful meadows, but it means no wasteful transport between sites for the birds (which is also very stressful for them). We grow our own hay for the chickens' bedding, we use best practice in maintaining and rotating our meadows, and we even slaughter and process the birds on site, which again not only improves sustainability but also reduces stress on the birds and results in an unrivalled product. Other sustainable practices come naturally as part of what we do – for example, our hand plucking uses wax which we reclaim and reuse time and time again, as opposed to the industry standard of wet plucking which requires vast amounts of hot water. Our business faces different challenges from the industry as a whole, because our product is based around quality rather than achieving the lowest price. For us, the biggest challenge is logistics and how we can get our products to customers (a mix of restaurants, butchers and individuals) around the country efficiently, sustainably and also at a realistic cost. 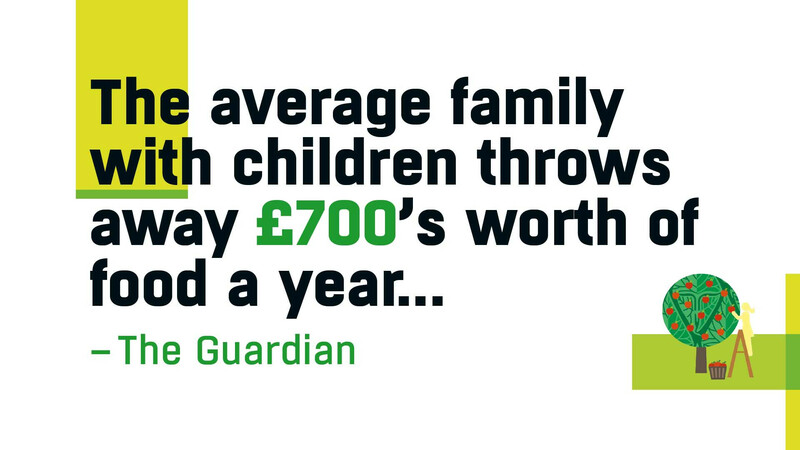 This is a real struggle and it's taken some time to develop our strategy, which now includes a distribution partner who collects in bulk once a week and delivers from their nationwide hubs, which vastly reduces wasted food miles when compared with individual collections and deliveries for each customer. For customers who live nearby we've teamed up with a local greengrocer who delivers our products to customers every Friday while he's already on his rounds, which has removed the need for our own refrigerated vehicle and uses his spare capacity instead. 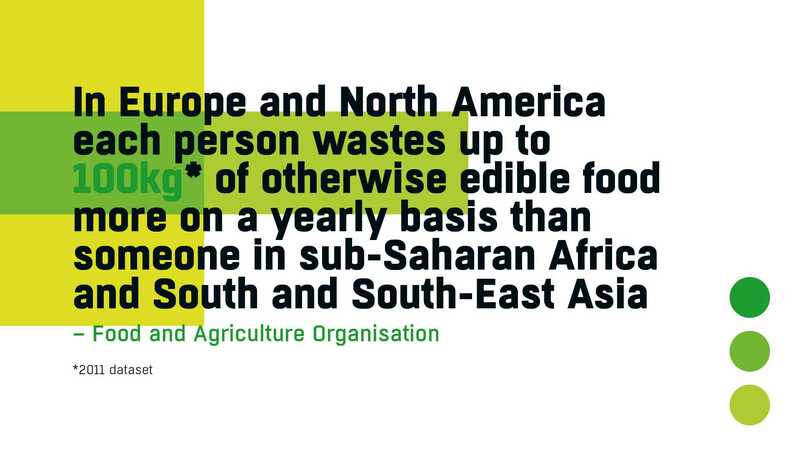 More than seven million tonnes of food and drink from our homes is thrown away every year in the UK, and over half of this could still have been eaten. 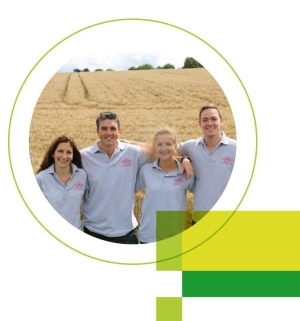 Our sustainability heroes are the organisations who raise awareness of this waste and educate people on how to live a more sustainable lifestyle when it comes to food and drink – people like the Hubbub Foundation. Our product is a perfect example of food which is often not used to its full capacity, with people regularly throwing away chicken carcasses with enough meat on them to feed a family for another couple of meals! 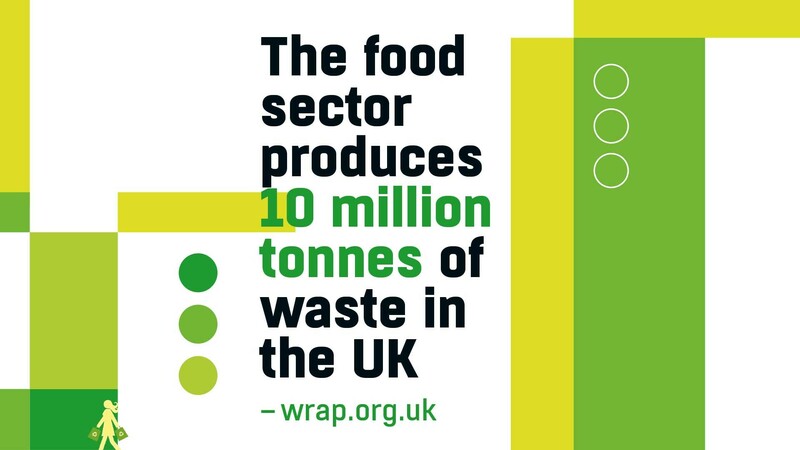 We find the organisations who champion reducing food waste vital in helping our customers to understand how easy it is to get more from our products and from food in general, so always do what we can to support them and pass their messages on. The MSC (Marine Stewardship Council) is the world's leading standard and label for seafood sustainability. We're helping seafood lovers to play a positive role that recognises and rewards sustainable fishing, ensuring healthy oceans for generations to come. Overfishing is the world's second biggest environmental issue after climate change. Yet there are also lots of well-managed fisheries out there. For shoppers and diners it can be a really complex issue, with lots of ever-changing and conflicting advice. We're trying to simplify that process, offering a robust, credible and trusted way to make sustainable choices. Just look out for our ecolabel. The UK is one of the most dynamic, forward-thinking and informed industries when it comes to seafood sustainability. 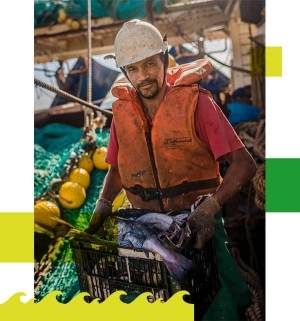 We have ocean heroes across the supply chain, and a huge amount of progress has been made over the last ten years, from fishermen to fish counters and from national supermarkets to your humble chippy. In 2015 £1 in £6 spent on seafood in UK supermarkets was for an MSC-certified sustainable seafood product. There's more to do, but that shows what we've collectively managed to achieve so far. Personally, when it comes to positively disrupting a market towards a sustainable future, Elon Musk is showing with Tesla that driving cars and contributing to climate change don't have to be mutually exclusive. Similarly, we want people to enjoy seafood for years to come – catching it, selling it and eating it. That's about ensuring sustainability from ocean to plate. 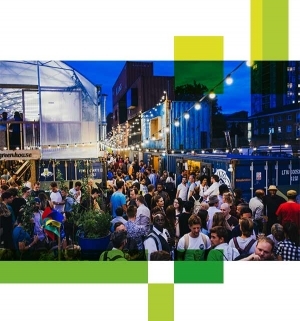 Sustainability is at the heart of Pop Brixton but we think of sustainability in the wider sense, and encompassing our involvement in the local community. We have clear objectives that focus on supporting jobs and enterprise, investing in the local economy and offering training opportunities within our community. We want our project to have a lasting legacy in the area, providing long-term social benefits, so this requires us to think about sustainability across everything that we do. Our site has been built predominantly from recycled and reclaimed materials, including the majority of the shipping containers we use. The idea is that at the end of the project, many of these can be moved and re-used, extending their life cycle beyond the lifetime of Pop Brixton. We also have our own on-site farm, known as Pop Farm. This allows us to grow fresh produce for our food businesses to use, just metres from their kitchens, but it also offers us a chance to run free horticulture workshops and training for the local community. We also work with an amazing waste disposal company called Quantum Waste. They are a local business with an innovative approach to recycling that turns food waste into fertiliser at local level, creating a zero-emissions sustainable cycle. We are also now preparing to launch London's first Community Fridge, in partnership with a group of local organisations. It's called The People's Fridge and it will both support food sustainability and reduce food waste. The idea is that local businesses, markets and even local people can donate any surplus food to the fridge, and it can be collected for free by members of the community. Similar projects have been massively successful in other countries, so we're really looking forward to getting it started. We are a temporary project, which gives us a very different perspective. Our site hasn't been built to last forever, it's been built to last as long as it's needed. I think this is something that a lot of other businesses and urban construction projects could learn from. But at the same time, it does present some challenges. With 53 different businesses based here on the site, it's not easy to manage every aspect of how they all operate. 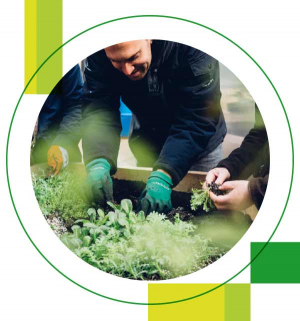 However, we involve all our members in our Community Investment Scheme, where they donate a minimum of one hour a week to local projects, which can include everything from horticulture to work experience and training for local students. We love the idea behind Farm:Shop in Dalston. 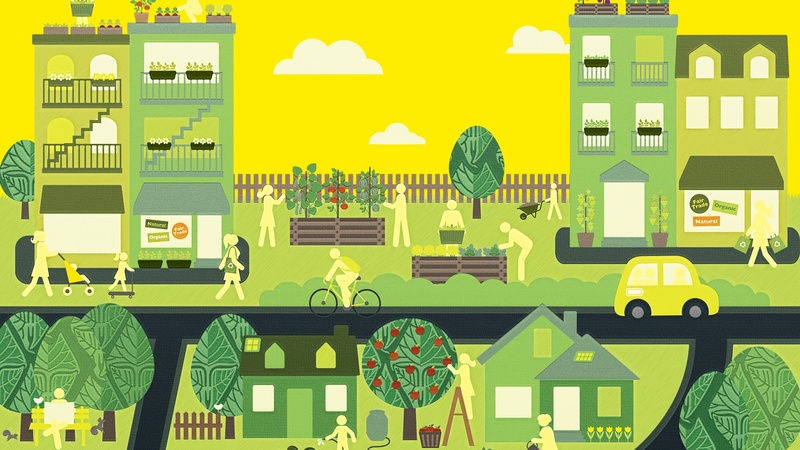 It's a urban farm built within a high-street shop, and it demonstrates how local growing can be used to benefit both local economies and the environment as a whole. It's really an art piece that makes a statement about how we could start to create real sustainability in cities. We also love our waste partners Quantum Waste, and want to give them a big shout out in the hope that they can continue to grow. There’s currently a crisis in chocolate and its sustainable future. It’s possible that not enough cocoa is being grown to fulfil our appetite for our favourite treat in the future, as the farmers are getting older and so are their trees, with the result that they are becoming less productive. Cocoa farmers don’t currently earn enough from cocoa to make it an attractive proposition for young farmers, who would invest in planting new trees and using the latest farming techniques. At Divine, we have tried to increase farmer income by setting up a company where the cocoa farmers own a significant share. Kuapa Kokoo, a cooperative of 85,000 cocoa farmers in Ghana, own 44% of the company and receive 44% of any distributed profit. We also pay a Fairtrade premium price for all the cocoa that we buy, which enables farmers to invest in their farms and generate more income. 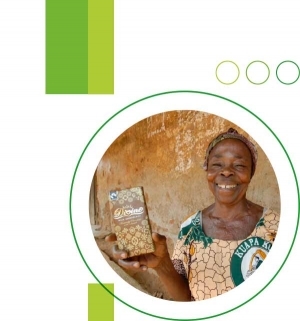 Divine was established to improve the lives of small-scale cocoa farmers in West Africa so sustainability has always been at the heart of everything we do. Recently we have been trying to improve the environmental impact of our packaging and reducing waste in this area; all our wrappers are now FSC-certified, and all the cardboard used for our packaging, such as Easter eggs, can be recycled. We avoid using plastic on our large Easter eggs in favour of recyclable foil and cardboard, and we are reducing our overall packaging waste by printing on smaller sheets across our products. The factory where our chocolate bars are made is committed to using sustainable energy sources and reducing waste – for instance the building is heated completely through waste heat recovery. In our office we also recycle everything, including our Fairtrade tea bags. Making farming an attractive proposition for younger farmers is an urgent issue for cocoa sustainability. They need to have a sustainable income with enough to invest in their farms, support their families and create thriving communities. We’re helping them to improve their farming practices and to look at diversifying into other crops to improve productivity, income and potentially nutrition, too. The industry has focused on increasing productivity without considering the potential impact on farmer income, so progress has been slow. To increase productivity, farmers have to potentially spend more on inputs and labour and this is a challenge. The climate becoming more unreliable is also a problem; cocoa requires lots of sunshine and rain, so a dry month can ruin the crop. Rubies in the Rubble are a really inspiring brand, as they use fruit and vegetables that would otherwise be rejected to create delicious chutneys while also creating jobs and training people. I’m also an admirer of Elvis & Kresse who are taking an innovative approach to reusing materials that would otherwise be thrown away; they make fabulous bags and accessories out of disused Fire Brigade hoses, an incredibly creative approach to finding new ways to reuse materials. We believe that truly successful social and economic development protects instead of destroys the environment. 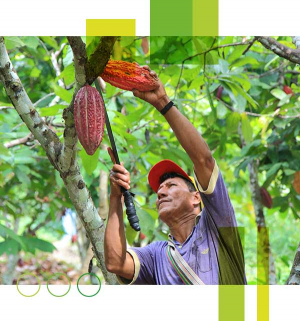 Our work aims to conserve biodiversity and ensure sustainable livelihoods by completely transforming how land is used, how businesses operate, and also how consumers shop. One challenge the sustainability sector is experiencing lately is companies who create their own ‘sustainability labels.’ That tends to lack the traceability that a third-party certification system like the Rainforest Alliance can provide. Consumers can’t be sure where non-certified cocoa, coffee, etc. came from or how it was grown, and the farms may not be subject to rigorous standards and audits. It’s often more difficult to ‘prove’ sustainability claims without a third party’s involvement in the supply chain. 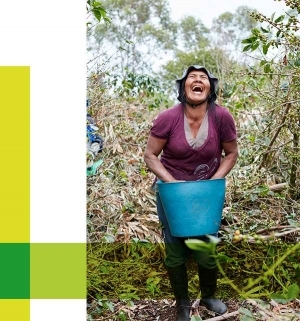 I’m fortunate in that I work with incredible people at the Rainforest Alliance, from our founders to our global staff. Take Daniel Katz, who established the Rainforest Alliance in the 1980s as a direct response to alarming rates of tropical deforestation. He led the organisation as president for over a decade and is now guiding us as the Board Chair. And our staff is amazing, dedicated and diverse. We’re able to have boots on the ground worldwide – from Indonesia to Ghana to Peru, and so many other places. One man in particular, José Roman Carrera from our Guatemala team, has received more than 80 death threats because he’s been opposing unchecked deforestation for decades, yet he’s still a tireless, committed team member. It’s stunning and humbling. We’ve seen some very exciting movements and new commitments in UK products very recently, such as Tesco’s commitment to cocoa from Rainforest Alliance Certified farms, Asda offering sustainably farmed bananas, and EAT’s coffee now being 100% Rainforest Alliance Certified. And there are many more companies who are long-term partners in sustainability with us, such as Unilever, Costa Coffee, and Taylors of Harrogate, to name just a few. 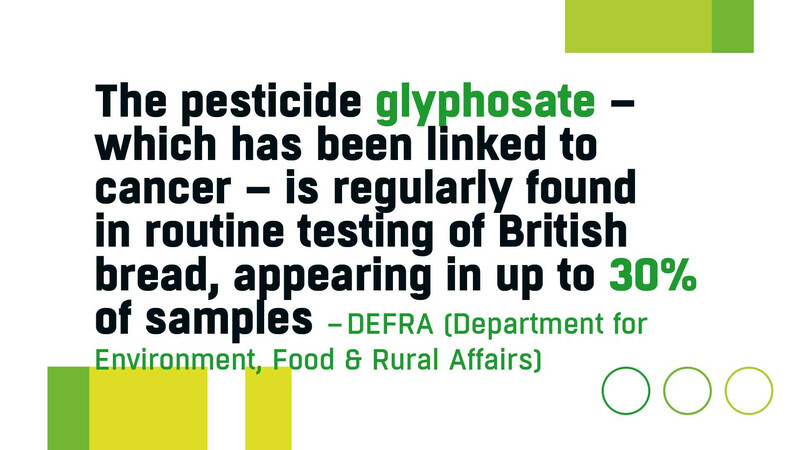 The UK’s food and drink industry has made leaps and bounds towards sustainability, so I’d say it’s definitely heading in a positive direction. Buying locally produced goods is a great thing for multiple reasons – but when you consider your entire supermarket shop, tropical products like bananas and tea cannot be grown in the UK. So if Londoners look for sustainability seals like the Rainforest Alliance’s little green frog while shopping, that’s a simple way to take action in support of environmental and social sustainability. It also sends a message to companies that sustainability is an important part of their business model. And once you start searching for our frog, you might notice it more often or probably begin questioning products that don’t have a sustainability mark! The other nice thing is that our reach extends into dining out now too, so if you look into the Sustainable Restaurant Association’s listings for dining out, restaurants that use products bearing our seal are considered more sustainable and can help improve a restaurant’s sustainability ranking. 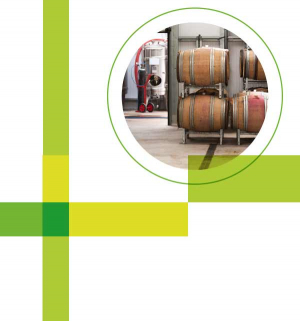 Logistically, being a sustainable winemaker can be a bit of a challenge as the change can often involve altering a procedure that has been established for some time. It is easy to convince myself of the need to change but getting that message across to the vineyard team can often take a season until they are on board and see the results. Some steps have been in place since the early days of Gusbourne. These include the selection of machinery, one example being the vineyard sprayers that we use. Since day one we have always used a recycling vineyard sprayer. Even though we are using conventional fungicides to keep the vines in good health, these fungicides are delivered to the vine through a recycling tunnel sprayer. 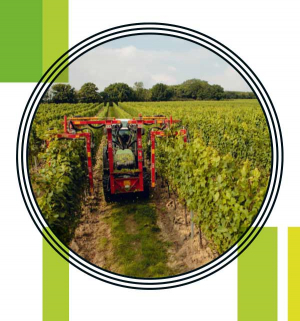 The tunnel sprayer is designed in such a way that the tunnels protect the spray pattern from wind, which massively reduces drift and ensures that the fungicide only hits its target and doesn’t drift into other crops or habitats surrounding the vineyard. Also the recycling feature ensures that any spray that misses the target is recycled back into the spray tank. This aids our bottom line as well as the environment. In the last couple of years we have been using cover crops to aid in soil conditioning through their root growth, and the biomass they produce to contribute to the friability of the soil as well as holding onto nutrients that would otherwise have been lost due to leaching. The cover crops (phacelia, clover mixes, birds foot trefoil) are also flowering plants that attract beneficial insects such as ladybirds and hoverflies – they prey on a particular vineyard insect pest (vineyard scale) that we have seen increase in our vineyards in the last few years. Hopefully through encouraging the beneficial insects we will see a reduction in the vineyard scale without having to reach for the insecticide. The introduction of compost is something we have been doing for a number of years. This is placed as a mulch underneath the vines and has many benefits including increased soil moisture retention, slow release nutrient (decreasing the amount of artificial fertiliser that we apply), improving the soil structure and friability as well as the soil microorganism population. Trying to reduce the amount of herbicide we use is our biggest challenge. Weeds can be a big problem in our vineyards. They compete with the vines for nutrients and water and if they become established they can grow into the vineyard canopy which can create problems with increased fungal disease due to lack of airflow through the vineyards. Recently we have been dealing with the weeds with a variety of cultivation techniques rather than relying on the easy option of herbicide. So far we have reduced our herbicide application from a total of four per year to two per year. With the investment in some new equipment we should be able to eliminate the use of herbicide in the vineyards. It is well documented that herbicide reduces the amount of soil microorganism activity. This has a knock-on effect on the ability of the vines to search out nutrients. Many of these microorganisms have a symbiotic relationship with the vine roots that benefit both the plant and the microorganism. I admire anyone who is growing vines and making quality wine in a challenging climate who has gone down the organic/biodynamic route and is making a success of it. Equally, those that have been following a very conventional route (herbicide and fungicide use) but are now beginning to challenge the way in which they grow grapes should be held up as examples of good practice.